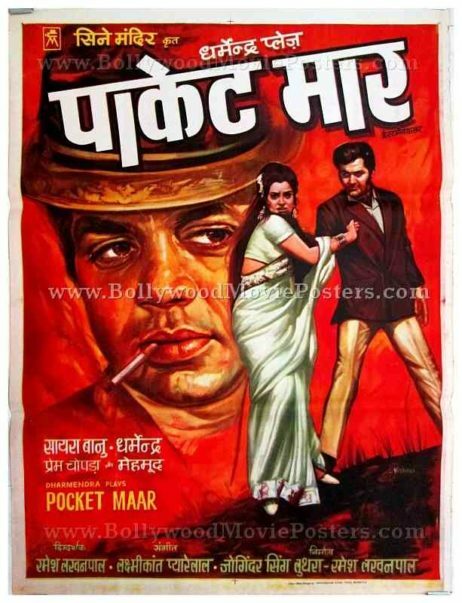 Beautiful hand painted old Bollywood poster of the memorable Hindi film Pocket Maar (1974) for sale. This poster was originally designed on a hand painted canvas by a highly sought after poster design studio in Bombay called Loombart, making it highly collectible. The poster features a stunning hand drawn portrait of Dharmendra, with an overlay texture added with a knife to give him a more rugged and macho look. Saira Banu, is featured in her beautiful avatar on the bottom, along with figures of Mehmood and Prem Chopra in the corner. 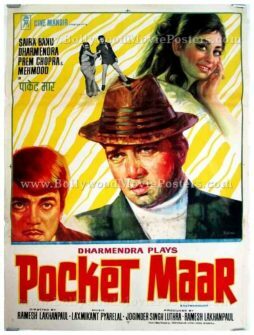 Pocket Maar (1974) is the story of a pickpocket hired by a woman to pose as her love interest. 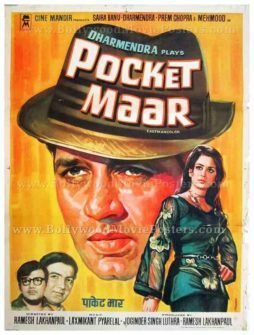 The film stars Dharmendra, Saira Banu, Prem Chopra and Mehmood. All four characters are represented in this beautifully hand painted old Bollywood movie poster.